Captain Horatio's crew of three consists of First Mate 'Beaky', Able Seamouse 'Twitch' and Cabin Boy 'Murky Waters'. 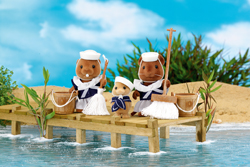 They help the Captain keep everything Shipshape - with mops and buckets, they work very hard, cleaning and scrubbing and generally getting wet! The Captain calls them his 'Motley Crew' which they like very much because it makes them sound like pirates on the Seven Seas.